It’s the game we’ve waited for all year. The Los Angeles Rams and the New England Patriots face off for the Big Game on Sunday, February 3. The Luxe Lounge, within the UltraStar Multi-tainment Center at Ak-Chin Circle, is your game-day headquarters at Ak-Chin Indian Community. It’s the game we’ve waited for all year. The Los Angeles Rams and the New England Patriots face off for the Big Game on Sunday, February 3. The Luxe Lounge, within the UltraStar Multi-tainment Center at Ak-Chin Circle, is your game-day headquarters at the Ak-Chin Indian Community. The Luxe Lounge is the luxurious 21-and-over sports bar, restaurant, and lounge located upstairs in the UltraStar Multi-tainment Center. Luxe Lounge offers 14 HD flat screen TVs for you to view the big game. Enjoy great Big Game specials on meals, appetizers, and drinks, including concession-style food. Specials start at 11 a.m. when Luxe Lounge opens, so make a day of it! The festive atmosphere at Luxe Lounge won’t disappoint — balloons in both teams’ colors will offer fun decor throughout. Whether you’re rooting for the Rams or the Patriots, grab your friends and co-workers and come on out to cheer on your team! Don’t miss the game-day raffle for one of two great prizes. You’ll receive a free raffle ticket for every $20 you spend in the Luxe Lounge, and winners will be drawn at the end of the game. You don’t need to be present to win, but why not stay to enjoy the game and earn more entries? 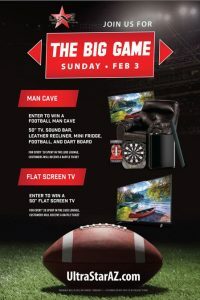 The grand prize, supplies for your very own man cave at home, comes complete with a 50-inch TV, sound bar, a leather recliner, mini fridge, a football, and a dartboard. One lucky winner will receive all the supplies needed to furnish their own sports fan’s dream room! The other raffle prize, a 50-inch flat screen TV, will put the finishing touch on any game-lover’s TV room. You’ll get more raffle tickets each time you spend $20, so keep trying for more chances to win! A private room that is available to you for your own group. If you’d like to have a party within the party, call to reserve (520) 233-2426. You and your team of friends will have a great time at the Luxe Lounge, no matter which team takes home the trophy!